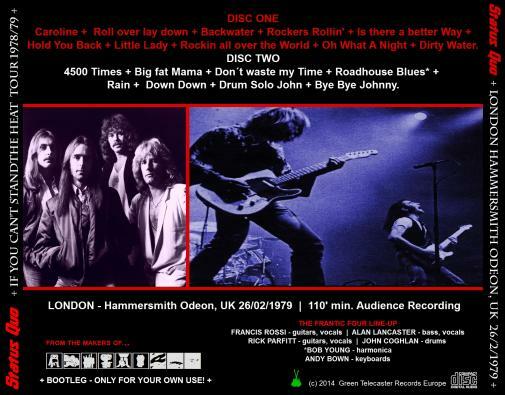 Main Setlist: Caroline, Roll over lay down, Backwater, Rockers Rollin', Is there a better Way, Hold You Back, Little Lady, Like a good Girl, Rockin'all over the World, Oh What a Night, Dirty Water, 4500 Times, Big Fat Mama, Don't waste my Time, Roadhouse Blues, Rain, Down Down, Drumsolo John Coghlan, Bye Bye Johnny. Tour Crew: Bob Young (Tour Manager), John Thompson (Stage Manager), Mal Kingsnorth (Sound engineer), George Harvey (Lightning engineer), Mal Graggs (Guitar tech), Roger Colpus (drum tech), Ian Jones (Keyboard tec), Jim McAndrew (Band Transportation). Management: Quarry Production. Manager: Colin Johnson, Alan Crux. 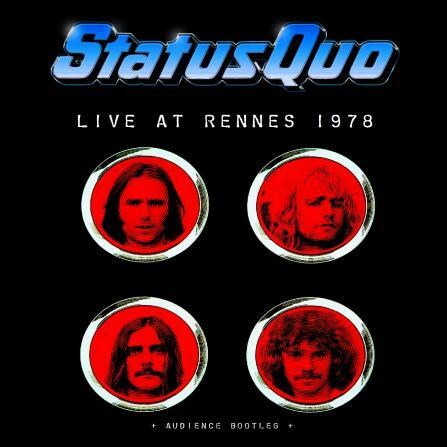 Tour Merchandiser: Status Quo Merchandise/Bravado. Support Band: String Driven Thing* only for the Wembley Shows. No support Acts for the full Tour. Tour Notes: Both Liverpool dates at the Empire were cancelled and rescheduled for Blackpool Opera House. 12/05/ UK, Birmingham - N.E.C. 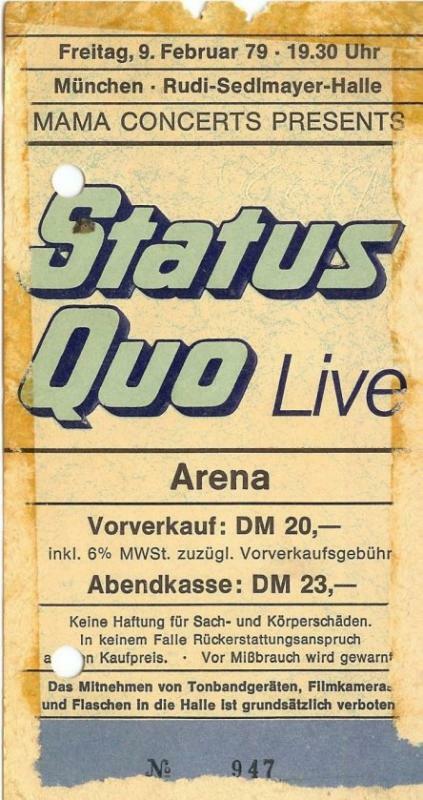 11.11.1978 - QUO's first visit to East-Germany. 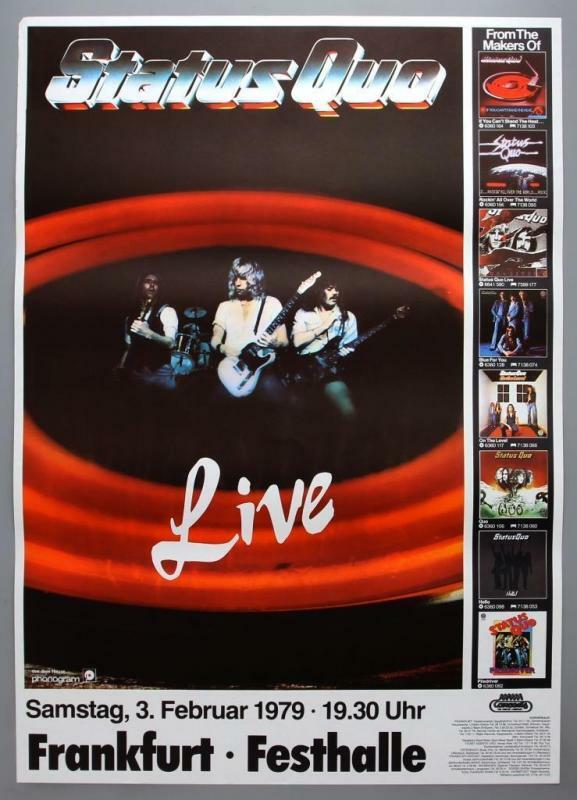 The band performed Again and Again, Someone show me home and Rockin' all over the World at the TV Show "Rund" in Frankfurt/Oder to promote the Amiga Vinyl Release of the "Rockin'all over the World" album. 19.1.1979 - "Bloody guitar!" 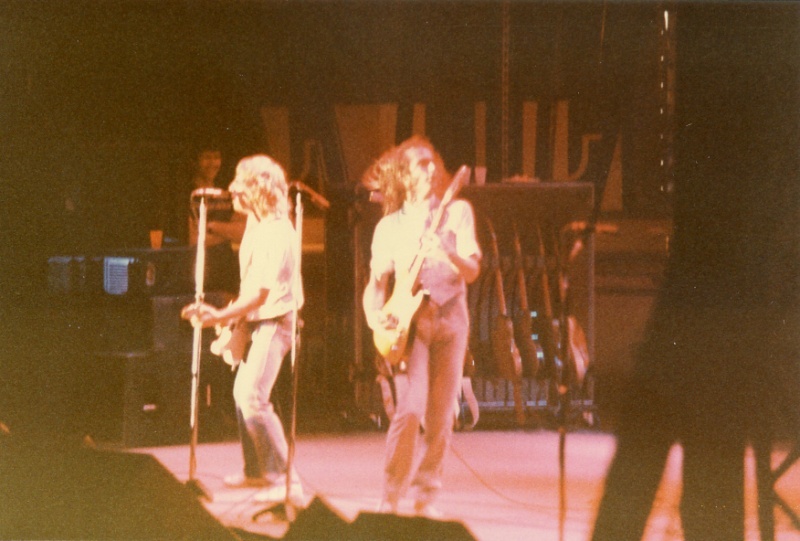 At the show in Hamburg, Germany Francis Rossi was badly hurt after the guitar-neck of Rick Parfitt's telecaster hit his face during "4500 Times". After a short break the band carried on with "Big Fat Mama". 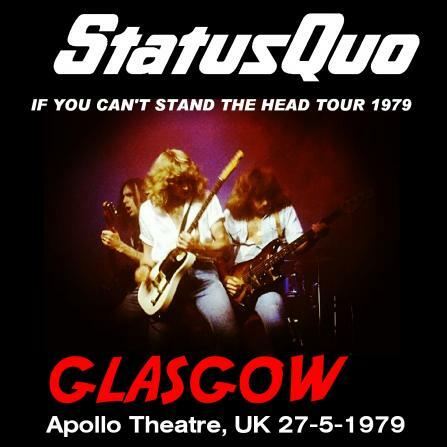 UK's Top Photographer Robert Ellis took pictures of this gig and they will be seen in his new book project "Status Quo for you..." (out in May/June 2017). 21.1.1979 - during the concert in Wolfsburg a german fan sadly died when he fell deep down (10 meters) through a huge window. 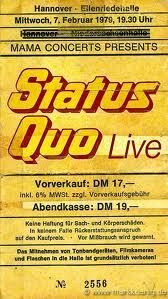 1.2.1979 - Francis Rossi badly injured at Sindelfingen Gig! Francis falls brutally to the rear and impacts hard on the monitor loudspeaker at the stage ramp. Francis lies on the stage without any movement. Aides hurry up and try to help him up on his feet. In vain. Francis does not come up. Meanwhile Rick, Alan, John and Andy continue to play. But they stopped when 2 doctors ran on stage. 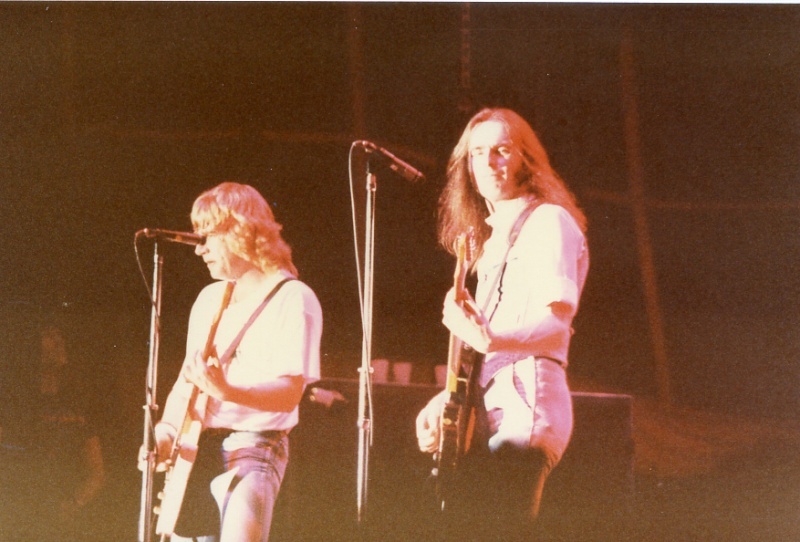 A terrible disorder on the stage, a short discussion: then Francis Rossi was carried away. The fans are shocked, some have tears in the eyes. One quarter of an hour passes. In prevails dead silence resounds. 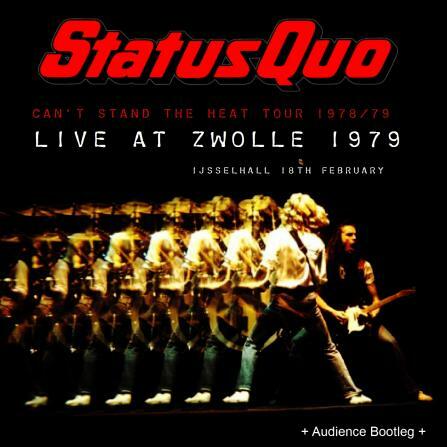 Everyone waits for an explanation whether the popular Quo guitarist injured itself seriously. 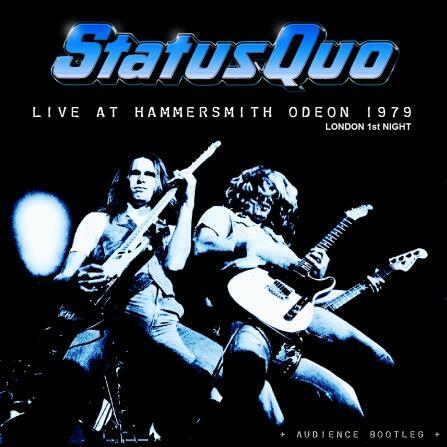 But then Status Quo came back on the stage much to the surprise of the audience. And Francis participates. 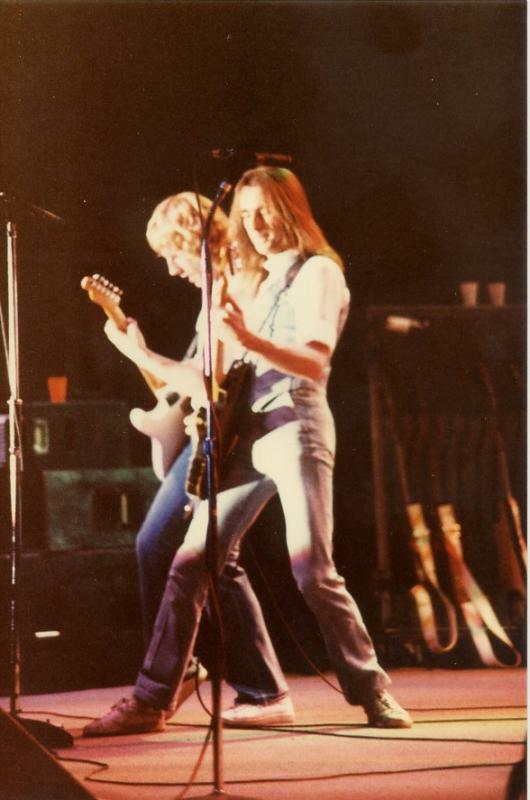 With the help of syringes, the Quo guitarist fights itself over the rounds. Immovably the hard professional, who otherwise would jump to the hammer volume of the rhythm like a "jump-in-the-field , stands there and his sweatful face can't hide his pain. The fans honored Francis inhuman efforts with applause lasting several minutes. 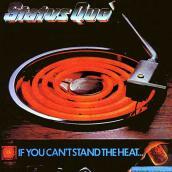 That leads to the fact that Status Quo gave three encores! One hour later in the hotel. Worried people here and there, still the shock is everywhere in all faces. " 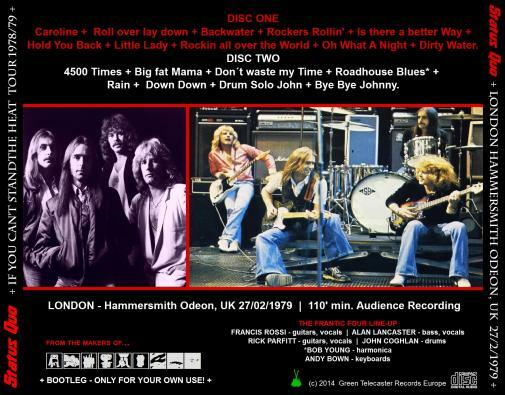 The whole thing was simply very unlucky" , explains Rick Parfitt. 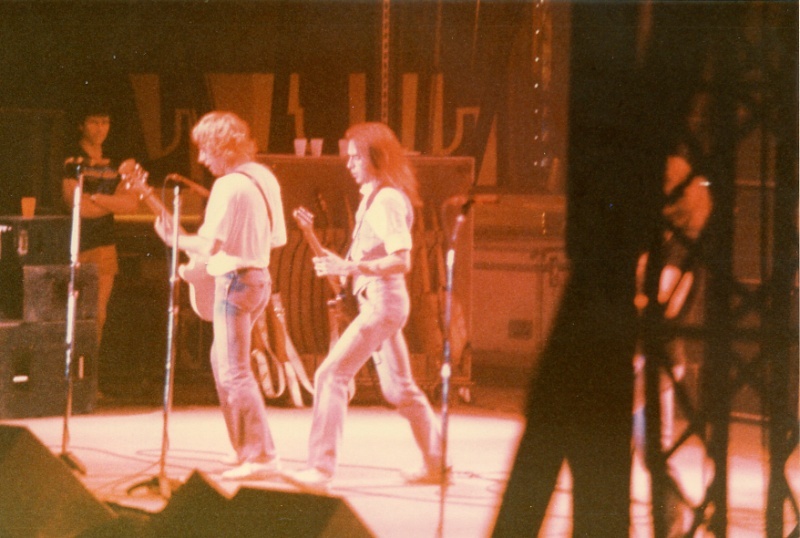 "Everyone of us guitarists felt already several times, without injuring ourselves. Therefore we also carried on playing today, the thing with Francis seemed harmlessly to us . We couldn't know that he hurt himself so badly." Francis Rossi laid on soft chair. " I must go to bed." he explains. " I am fully slammed on the coccyx after my fall. I could not move genuinly any longer, the pain was cruel. My back is now still full of pain. I hope, the thing heal fast. It makes no fun for me, to stand on stage without moving." 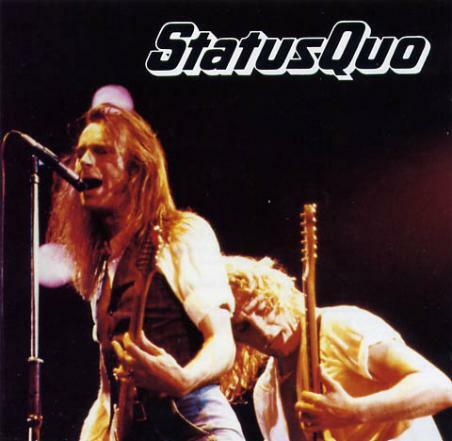 Before the Status Quo guitarist disappears, he means " I must thank all the fans. They were fantastic, perhaps somewhere else the people would have whistled, but not in Germany. 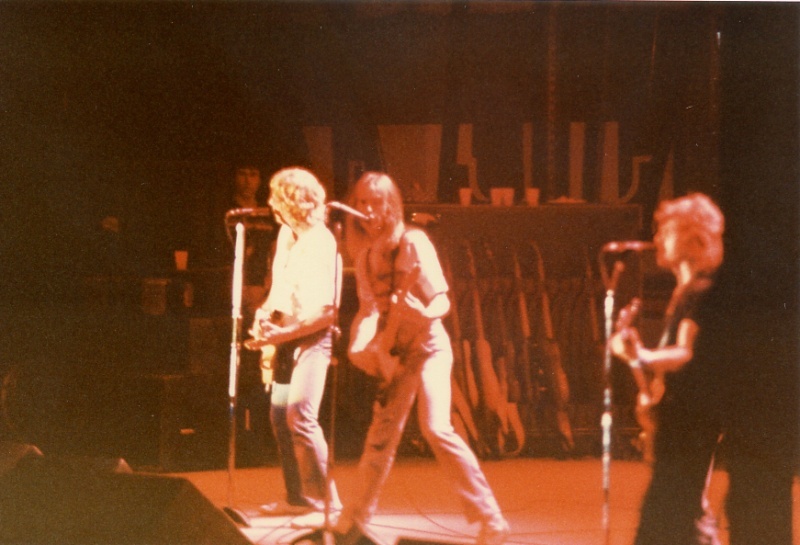 09.05.1979 - with the first show in London's Wembley Arena, the first UK-tour since November 1977 kicked-off. 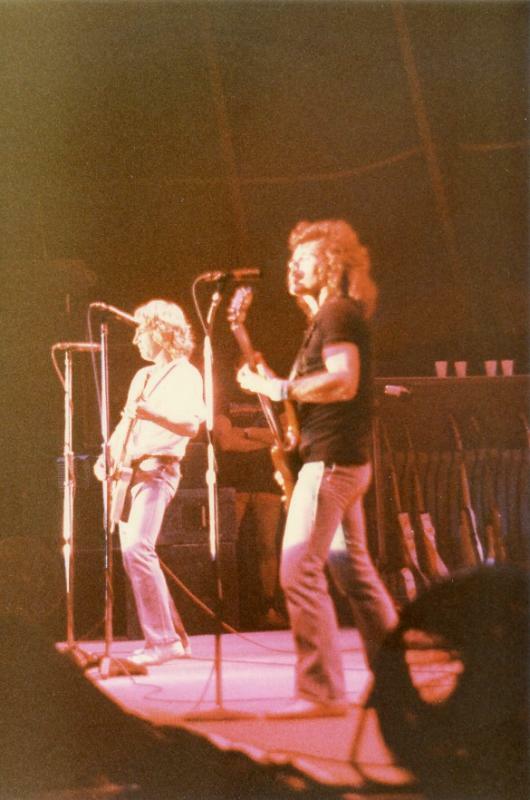 The ticket demand was that high, that additional shows were added and the whole tour included 33 concerts. All shows were sold-out. 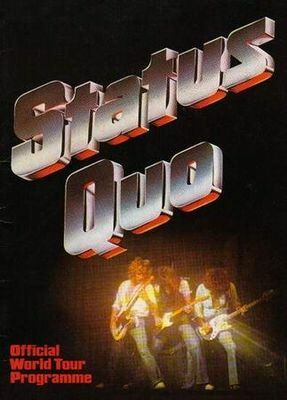 The tour was christened the "The Authorised Tour" - because Status Quo were promoting themselves on this tour and to promote the first Quo publication - the book "The Authorised Biography". Accident Prone? Tour crew member Ian Hill, one of the riggers, fell from the top whilst dismantling the rig at Wembley Arena. 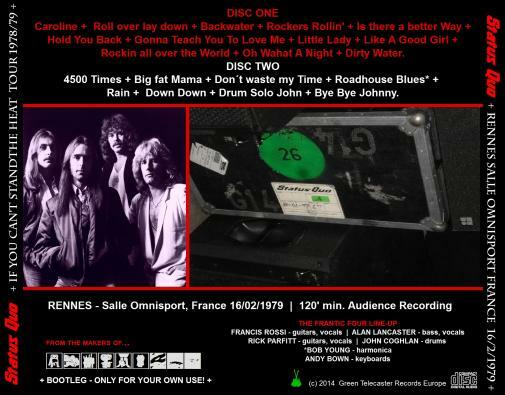 But another thing is worthy to mention about this tour: very cleverly the PYE record company chose this tour to promote the release of the PYE album "Just for the records" when the visitors of this UK tour were given a free copy of a QUO flex-single "In my chair" (PYE SFI 4343).